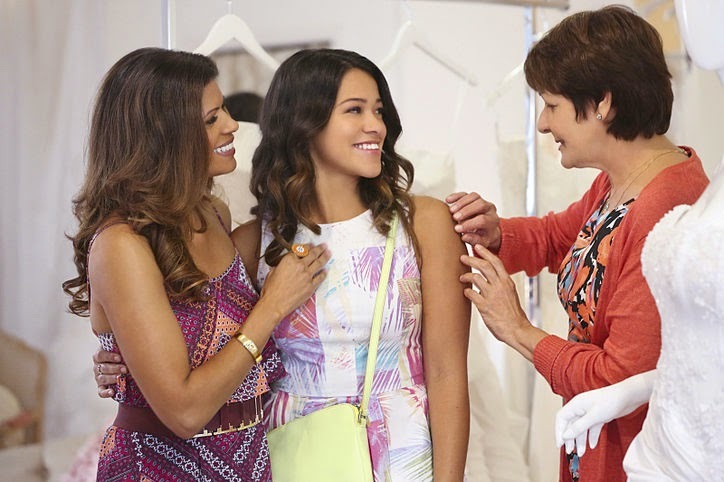 It still feels a little surreal to me that Jane the Virgin was actually nominated for a Golden Globe, and that Gina Rodgriguez actually won for her portrayal of Jane Villanueva. It feels weird, because I’m not used to shows by and about women of color getting that kind of recognition. Especially not shows like Jane the Virgin, which are aimed at teenagers and young women, that have an openly comedic tone, and which celebrate the accomplishments of women of color. I’m super not used to the idea of a show on the CW getting nominated for any award, let alone wining one. That’s weird too. But for all that this is an unfamiliar sensation of happiness, I’m certainly not upset about it. Just because it’s unfamiliar doesn’t mean it’s bad. Not at all. I’m over the moon with this, you guys, and I’m so happy that this wonderful little show is getting the recognition it rightly deserves. I will say, though, that I’m kind of disappointed that Gina Rodriguez was the show’s only acting nomination. Don’t get me wrong, she totally deserved that Golden Globe because she’s awesome, but I also think that there are a couple of other actors on the show that need a shoutout too. Jaime Camil has been tearing it up as Rogellio, and I give him a lot of credit for turning a naturally bizarre and hilarious character into what feels like a real person with feelings and flaws. Ivonne Coll is also fantastic as Alba, mixing firm practicality with occasional flights of fancy, and Yael Grobglas deserves a lot of credit for her ability to somehow make Petra Solano both villainous and endearing. My favorite has to be Andrea Navedo, though. Her portrayal of Xiomara Villanueva is one of the most nuanced performances of what it means to be a single mother that I think I’ve ever seen. Because for all that Xiomara is flighty, flaky, and an unrepentant man-chaser, she's also deeply sacrificial, selfless, loving, and a really stinking good mom. And it's the combination of all of these traits, her love of booty shorts and her intense desire to make the world perfect for her daughter, that make Xiomara into one of my all time favorite female characters. So, just to refresh you all, Jane the Virgin is a light dramedy about a devout young woman, Jane, whose normal gynecological appointment goes a bit off the rails after she's mistakenly artificially inseminated. This ridiculous event happens about five minutes into the first episode and the rest of the show is about Jane coming to grips with the telenovela ridiculousness that has taken over her life while also trying to prepare herself to become a parent. Most of the story revolves around Jane and her romantic life, her job prospects, all that good stuff. Jane's kind and loving and responsible and hard-working and it's incredibly easy to root for her. Sure, her personal life is more complicated than most soap operas - and she would know because it turns out that her father is a telenovela star - but it all usually works out for the best. Cue the light-hearted music and a montage of everyone smiling. But seriously, the show is weird but super fun and I highly recommend it. In all of this focus on Jane, though, it's easy to lose track of the other characters on there, which is a shame because most of them, especially Xiomara, are the kind of nuanced, complex, fantastic characters who would be the breakout stars on any other show that wasn't just so jam-packed with goodness. That is not, for the record, a complaint. Xiomara is Jane's mother and best friend. A teen mother herself, Xiomara put most of her life on hold to raise Jane, and to a large extent she still is, even though Jane is now twenty-three. Xiomara always dreamed of being a singer, but while Jane was growing up, she put aside that dream and worked a series of dull and slightly demeaning jobs to make sure that her family was safe and supported. And even though Xiomara, who frequently goes by Xo, can have a contentious relationship with her mother, Alba, clearly they love each other enough to still be living together after all this time. It's the little things: Xiomara, Jane, and Alba all use public transportation in their daily lives, and when Rogellio gives Jane a car as an extravagant gesture of paternal affection, they all share the car between themselves. We can understand from their basic lives and the way that the Villanueva women talk so freely about money that it has been a big concern for them in the past and that even if they are pretty financially stable right now, they're not by any means what someone would consider "well off." I mean, just the simple fact that after becoming pregnant as a teenager and deciding to keep the child despite her mother's objections, and also refusing to name the child's father so that her mother would not force her into a marriage she really didn't want, after all of this, Xiomara still lives in her mother's house and has forged a strong relationship with her... It speaks to the idea that Xiomara couldn't run away because she didn't have anywhere else to go, but also the fact that she values her family and no petty grievance will make her abandon them. This isn't to make her out to be a saint or anything either. I really love how the writers trust us enough to let Xiomara be a complex human being. Which she totally is. She can put on a mantel of self-confidence and sexual energy, but when it comes time for her to walk into a room full of record producers and executives, we discover that Xo is actually really self-conscious and worries that she looks old. Or when she accidentally discovers that Jane wrote a story about her, using her as the basis for a slutty single mother, Xo cries over what her daughter must think of her and then sends the story in to be published because regardless of her feelings, it's a good story. She's not perfect, is what I'm getting at. Xiomara openly owns up to the fact that she made Jane's teenage years hell by dating the father of one of Jane's fellow students. She's not above using her womanly wiles to get what she wants, or above getting into the occasional catfight. She can be a little silly and she often talks to posters of Paulina Rubio when she needs an emotional lift. Xiomara worked her whole life to get a chance to show the world how well she can sing, but when she hits the first snag of rejection she almost gives up. She can be brilliant and confident and hilarious and strong and also incredibly timid and sad and vapid and shallow. She is all of those things and that's great. It's great because Xiomara manages to simultaneously fit and subvert our cultural expectations for a "Hispanic single mother." Yes, she's of a lower tax bracket and yes she isn't particularly educated. We're never told definitively but I would be shocked if we learned Xiomara had gone past a high school diploma - school's just not her thing. Yes, Xo is prone to low-cut tops and incredibly short skirts, and yes, she dates. A lot. But that doesn't mean she's not still a good mother, nor does that really say anything about her in general. Xiomara admits to Jane late in the season that she very intentionally didn't date seriously while Jane was growing up because she didn't want her daughter to get attached to some guy just for the relationship to go south and Jane to lose a father-figure. So, yeah, she mostly dates casually, but that doesn't mean she doesn't want more or that she isn't going to get around to pursuing it one of these days. And sure, Xiomara can be "dramatic" and "passionate" like the dumb firey Latina stereotype that for some reason won't go away. But she can also be incredibly logical and giving. She knows she's in love with Rogellio, but intentionally takes a step back so that he can focus on his relationship with Jane as they get to know each other as father and daughter. She's angry when she hears that Jane's ex-fiance, Michael, broke her heart, but she also urges them to reconcile, because she sees the value of a good relationship that lasted for two years and was heading for marriage. In other words, Xiomara is complicated and that's a very good thing. Because she fits a lot of the stereotypes about a Latina single mother, it would be easy to denigrate Xiomara or claim that she's not a valuable character. But that would be very wrong. She is valuable precisely because she takes those stereotypes and humanizes them. She shows how behind every caricature of a woman is a real. breathing human being who needs our love and compassion. Xiomara isn't a perfect person by any means, and that's the point. She's human. She's not an animal and not a god, she's a woman. In all her imperfect, weird, kooky glory. And I'm very thankful for her. *Please please please don't decide this is the moment to attack me for not loving Lorelai Gilmore enough. I love her lots and lots, but I do think that we as an audience need to be aware of when a character, even one as amazing as Lorelai, has been written with an instinctual white privilege and operates in a world of blessings and coincidental opportunities. Which she totally does. It doesn't make her any less of a great mother or a fantastic success story, but it's worth remembering exactly how good Lorelai has it.